For my last race of the year I chose to do the Jingle Bell Run in Raleigh. I ran the race last year and ran my PR at the time coming off the Monumental Marathon a month before and not doing any 5K training for it. The race benefits the Arthritis Foundation. Instead of going for a PR this year I opted to do it purely for fun and to run with mine and Jamie's dog Bud. Bud was an owner surrender we adopted from the Pitt County Animal Shelter. I don't know how anyone could surrender him because he is so nice, loving, and he's a big cuddler. He will get in anyone's lap and has a tendency to get in laps of kids after races he's gone to in the past where he watched me run. Bud is a Jack Russell, Beagle, Min-Pin mix breed dog. He is a ball of energy. He's hiked 6 miles in Umstead with Jamie and it didn't tire him out. I've also ran in for 2-2.5 miles several times and after drinking some water he's rearing to go again. I think running him makes him more hyper as he comes in and starts going crazy playing with his toys after a run. We just got Bud a new harness, the webmaster made by Ruffwear. It's an expensive harness but you can usually find them cheaper on Amazon brand new or even slightly used. It's worth the money! This is the only harness you'll ever need. It's supposed to be inescapable which is what Bud needs since he's gotten away from me and Jamie three times but we were lucky we got him back. The weather for this year's race was similar to last year; on and off rain, overcast but it was warmer with temps in the mid 50s opposed to the upper 30s last year. Jamie, Bud, and I arrived at Saint Mary's School around 9:30 for the race. The race started at 10:30 but last year it was packed trying to pickup your timing chip race morning so I wanted extra time. Getting the chip this year was a lot faster. After that we just walked around looking at the different vendors and saw they had a photo display set up with Santa and fake snow so we got in line to get a picture. Our friend Laura took the picture of Jamie, Santa, Me, and Bud. This is a big race and I worried how Bud would do in the large crowd. As we were walking to the start line he was getting nervous and scared. I chose to line up at the back of the field for several reasons. One, to respect the faster runners and those going for time and two I was hoping it would help ease Bud's nerves. It was a packed starring line with over 800 runners in the race. Jamie and I carried him to the back and got a spot and waited for the race to start. Bud quickly found a kid and was letting him pet him. Bud got a lot of compliments on his looks and his jingle bell collar. The race started 10 minutes late for some reason. The crowd was moving slow towards the starting line so I carried Bud to the line. I hit start on my watch as we crossed the line after putting Bud on the ground. It was still too congested for Bud's liking so I ended up carrying him for the first 45 seconds or so before putting him back down and moving to the sidewalk to get out of the congestion. We made the right turn onto Hillsbrough Street and stayed on the sidewalk. Bud was in full running stride now and loving being out of the crowd. We quickly started passing a lot of runners and stayed on the sidewalk until we got to the first roundabout. The crowd thinned out some so we got in the street and Bud was still passing people. I was letting him run whatever pace he wanted but her was running faster than we had on any of our training runs. People watching the race cheered as we passed, saying Go puppy! Bud ended up getting on the median as we kept running the gradual uphill towards the turnaround. I started looking for some friends that were running the race. I first saw one of my training partners, Ryan Laytham. Ryan was looking smooth and in 2nd place. I next saw Brandon Whittaker. Brandon and I have been friends since high school where we ran against each other, him going to Croatan High School and me going to East Carteret. Brandon was also looking fast and on pace for his goal. Bud and I ran the first half in 12:19, that's 7:49 min/mile pace. We rounded the turnaround and Bud was still cruising along fine. After a gradual uphill first half the second half is downhill with only a couple gradual inclines on the way back to the start. Bud was still getting a lot of cheers from spectators and other runners and walkers on the way back. I was letting Bud run his pace. I've raced with dogs in the past in the 5Ks 4 K9s volunteer group but this was the first time I've raced with one of our own dogs. Bud was loving it and so was I. I had a smile on my face the whole time. It was a lot of fun racing with him just for the fun of it and seeing his facial reactions letting me know he was enjoying it was worth it. We did pick the pace up on the way back. Bud was impressing me with his speed. He was running faster than any of our training runs. I think being in a race and chasing people helped a lot. We ran the second half in 11:12, 7:08 min/mile pace to finish in 23:34 for an overall pace of 7:29 min/mile. Since we started at the back of the field results are based on gun time so we finished 159 out of 887 runners. We actually finished higher than that if you go by chip time. Chip time is when you cross the starting line of a race. Gun time is when the race starts but for those in the back gun time is not their accurate time because it takes them seconds and sometimes minutes to even get to the starting line of a big race. Per USATF rules, awards and results are based on gun time. Racing with Bud was a great decision and I don't regret it. There are plenty of races to go for time and be competitive. Not every race is about PRs and winning. It was a lot of fun to race with Bud and see how much he enjoyed it and hear all the cheers he got. Bud impressed me with his speed and his time. I'm so proud of him. If you do want to be competitive and go for a PR then this is the race for you. It's one of the fastest courses in the Triangle with his downhill final 1.5 miles. The weather in December can be rainy but the colder temperatures are worth it. Ryan ended up finishing 2nd Overall in a new PR of 16:45. Brandon finished 6th overall and 3rd in his age group in 17:35. This is a well organized and put on race. A lot of people do run in Christmas costumes and it was nice seeing other dogs in the race as well. This is one of my favorite races and I highly recommend doing it for fun or if you want to run a personal best. In June I realized I had raced in every month so far this year so I decided to finish the calendar year off with a race in each month. I had never raced in each month in one year before but since opportunity was there I decided to go for it this year. I don't plan on doing it again next year or in the future. It just worked out well this year to do it. There are several competitive and large Turkey Trots in the Triangle Area but I've always enjoyed an easy run back home with friends on Thanksgiving morning instead of racing. Instead of doing a Turkey Trot I chose the Chestnut Ridge 4 Miles Trail Run in Efland, NC when it was posted in the Facebook group, Running In The Triangle, by Race Director Alan Schumacher. The race looked fun and different for me since I rarely race on trails. Trail running and fall go together and I was looking forward to it. My last off road race was a 5K in August on the Wake Med Cross Country course but that is not trail running. My last true trail race was the 2011 Continental Divide 10K Trail Race in Laurel Springs, NC and that is one of the hardest races you will find anywhere in the country. 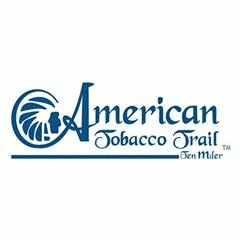 I took a week off from running after the American Tobacco Trail 10 Miles race at the end of October. I enjoy taking a week off post marathons and after a long racing season. A week or more of rest, one planned and not forced on by injury or overtraining which could have been a result of not having a rest period, rejuvenates the body and mind in ways that outweigh any losses in fitness. Planned breaks take the pressure off – you don't feel that your training is never-ending, jumping from one goal to the next. Science is discovering that the chemistry of the brain, the hormonal system and the immune system are compromised during hard training. Breaks rejuvenate these systems, allowing us to train better, more consistently and with more zeal across the next training plan. After my week off, I was running easy; no fartleks, no intervals, and no tempos. Just a mix of general aerobic and recovery runs. My total mileage hadn't gone over 30 and my long run was 9 miles. Yes I still wanted to be competitive in this race but I was mostly just looking to run in the woods for fun during a race with no pressure on me. It was me versus the course, not me versus the clock or competition. The Chestnut Ridge Camp and Retreat Center was easy to find. It is exit 160 off I-85/40; roughly 4 miles west of Hillsborough and 6 miles east of Mebane. If you use GPS navigation know that the race site is on an unpaved, gravel road. I arrived at the race at 9:00am. The 4 and 8 miles races started at 10:00am. This was the first time I had gone to a race by myself. My Dad couldn't make it because our Church was setting up for homecoming and Jamie couldn't make it either. It was weird going to a race by myself especially one where I didn't know anyone else there but the people were friendly and welcoming. Packet pickup was easy and well organized. The race shirt was a very nice polyester/cotton blend. Runners also got a free pair of nice tech socks. They had hot coffee ready and a heated activity center with heated bathrooms open for the event. The race benefits the "Pass It On" Annual Fund which supports the camping ministry, enhances facilities and equipment, and helps send children and youth to camp through the campership scholarship program. After doing my usual dynamic warm-up I headed off for an easy 15 minutes. I didn't go on the single track trails and stuck to the gravel roads. It was cold with temperature in the low 30s but sunny. The 4 and 8 miles races start together and run the first 4 miles together. I lined up on the front for the start. The cold weather felt good to me. I wore my 2XU compression shorts, Capital Run Walk nightlife singlet and matching arm warmers, and gloves. The race started and I went out fast knowing I had to before we hit the single track trails when passing would be difficult. The first half mile or so was on a gravel road and I was feeling good. I hadn't ran fast in weeks so my body was adjusting but my shoes felt good so far. I was in second place, behind one in the 4 miles race. We entered the first single track section of trails and this is when the race really started. The trails were in good shape, hardly any mud. The trails were even swept the day before so there was a clear path and trail markings to guide us. There were a lot of roots and rocks and twisting turns. The Adios shoes were still doing well on the single track. I was passed by three runners, two in the 8 miles and one in the 4 miles race, after we came out of the first single track section. We were back on a gravel road as we went by the horses. I was now in 3rd place in the 4 miles race. We soon entered another single track portion where the majority of the race was on. It was hard trying to go fast on single track trials when I'm not used to racing on them. I was keeping my eyes on the trail making sure I didn't fall over any roots or rocks. I wore my Garmin 220 but I rarely looked at it the whole race. I knew the GPS was going to be off on the single track trails and time didn't really matter. I was racing the course. I knew by my effort I was running between 6:30-7:00 min/mile pace on the single track trails and was low 6 and under on the few gravel road sections. Shortly after 3 miles the course go around Lake Fellowship. The loop around the Lake was my favorite part. The footing was some of the best on the course allowing me to pick up the pace. It was still rooty in places but the loop around the lake is mostly grass. I was still in 3rd place but gaining on 2nd and I kept hoping we could get a final gravel road section so I could possibly catch him. We did get a final section on the gravel road and I picked up my pace trying to catch 2nd place. I wasn't able to catch him and I finished 3rd in 27:46. My Garmin showed 4.31 miles so I knew it was over 4 miles but it being over the advertised distance didn't bother me, it's common in trail running. 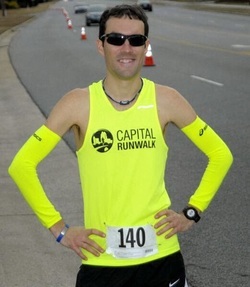 First place in the 4 miles race went to former Duke University Cross Country and Track Runner Cory Nanni in 23:45. The winner of the 8 miles race was Erik Johnson in 55:46. The post race amenities was impressive for a small race. They had a lot of baked good, hot coffee and hot chocolate. I've ran bigger races that didn't have as nice of a post race food selection. I had to try some of the coconut cream puffs and they were amazing. They also had bagels, muffins, assortments of breads, and cookies. The post race awards were nice. I finished 3rd overall and 1st in my age group and received an ice hand made wooden metal. Even though the Fall colors had long since peaked some were still holding onto the trees and they were pretty. Overall it was a very pretty course and the trails were great. There are some hills on the course but they are rolling and not bad at all. This was a fun race. It is very well organized and put on. No complaints about this race. I recommend doing this race. The Magnificent Mile Race in Downtown Raleigh was my race for the month of September. The race was first held in 2006 with proceeds going to Primary Lateral Sclerosis, a motor neuron disease related to ALS. Since its inception, the race has raised more than $450,000 from sponsors and individual donors for research into upper motor neuron disorders. The race is the NC-USATF mile state championship race. It has drawn some incredible runners over the years. State records for men and women have been set at this race. Bobby Mack holds the course record of 4:10 set in 2009. The women's course record of 4:51 was set by former ECU Cross Country and Track runner Brittany Copeland in 2012. This years race was also a Bring Back the Mile Featured Event. Bring Back The Mile featured two events in North Carolina this year, the Sir Walter Miler and the Magnificent Mile Race. I had not ran the race before but had heard great things about if from friends that have ran it. I've only done two, mile road races and they were on out and back courses. 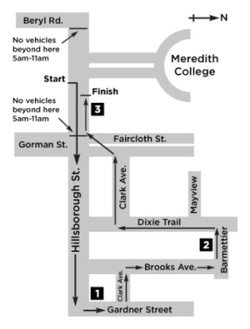 The course for the Magnificent Mile is a fast and flat course that starts on Hillsborough Street and goes to and around the North Carolina State Capital building and back down Hillsborough Street for the finish. I hadn't been doing any mile specific training as I have been training for the NC-USATF 10 miles state championship held on the American Tobacco Trail on October 25th. I still expected to be faster than my previous mile road races because the course was not an out an back. Jamie and I arrived at the race around 1pm for the 2pm start for the men's competitive race. Afternoon races are weird for me because I'm not sure what to eat during the hours leading up to it and it's a lot of waiting for race time to finally arrive. Sleeping in was nice though and I had a good brunch at Jamie's parents house around 10pm. Shortly after arriving at the start I saw my friend Pat Price. He's ran 5:02 at this race in the past. Pat and I ran the course and then added on another mile for a 2 miles warm-up. There is a gradual uphill start for the first quarter mile but it is subtle. I talked with some friends and Jamie before lining up behind the strong elite field for the start. After the race announcer introduced some of the elite runners we were ready to take off and see how fast we could cover one mile. The gun went off and there was a flood of runners bolting off the starting line. I knew I just had to get after it from the start and not even think about pace like in my usual races. I didn't even notice the gradual hill for the first quarter because I was fresh and the adrenalin was pumping. I wasn't with the leaders, they were quickly pulling away from the field in a tight group. I did see Bobby Mack leading as we neared the first turn. I was surprised how many kids were still holding on that went out fast, some in front of me and some around me. The turns were congested and everyone was jostling for position around them to cut the tangents. Runners were using elbows to protect their space or make space to get through some of the congestion. I had to put my hands on a kids back that suddenly slowed in front of me before the half mile mark. I started working my way through the field and passing runners as we neared the half mile mark. I think I ran the first half in 2:34. I was feeling good and kept picking my way through some congestion. I kept running hard, passing runners, while trying to speed up to take advantage of the slight downhill finish. I felt that my leg turnover was good and I was running faster than I thought I would. I could see the clock at the finish line as I ran hard down Hillsborough Street. The clock was in the 4:50s as I neared. Breaking 5 would be awesome I thought and kept digging. I ended up finishing in 5:05.3 for 23rd overall out of 248 and 7th out of 15 in the males 30-34 age group. The overall win went to Wilkerson Given in 4:11.3. Bobby Mack finished 3rd in 4:14.1. Bobby, Sandy Roberts (4:18.8), and Tibor Vegh (4:26.7) representing Capital RunWalk won the team category. The women's race was next at 2:20pm. The top three women broke 5:00 with top honors going to Cristy Cazzola of Oshkosh, WI in 4:41.1. There was also a recreational mile and kids race. I did a 2 miles cool-down with fellow Capital RunWalk teammates Elinor Angel and Ronnie Jones. They both ran PRs. There were a lot of impressive times in the age groups. I was happy with my time considering I hadn't done any mile training for it. I set a new road mile PR and it's been my fastest mile in a race since high school. I plan on doing this race again with the goal of breaking 5:00. I think I can break 5:00 with more mile training to develop a faster leg turnover. I loved the course, the atmosphere, and the race. I had a lot of fun. I'm a supporter of seeing more mile races and support the Bring Back The Mile Movement. This is a must do North Carolina race! The 35th Historic Beaufort Road Race on July 19, 2014 marked my seventeenth consecutive year of running my hometown race. This was my first ever road race back in 1997 where I ran the 5K. I've ran the 5K the most, followed by the 10K six times counting this year, and the mile twice. I've been second overall in all three events. I chose to do the 10K again this year because I am better at the longer distances and felt the 10K was my best shot at an overall win. My best 10K time at Beaufort is 37:21 set in 2007. This race is known for being hot and humid. I had one goal for this year's race, to win! I didn't care about time, I just wanted to win for Sonny Hyman. Sonny passed away earlier this year and I wanted the win to honor him. 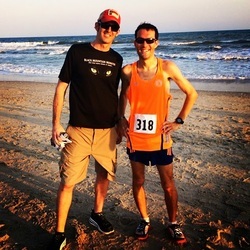 Sonny and his wife Taylor started the big three races in Carteret County; The Lookout Rotary Spring Road Race, The Historic Beaufort Road Race, and the Twin Bridges 8K Road Race. Although Sonny never ran the 10K at Beaufort, he told me July was just to hot and humid for a 10K, he ran the 5K and won countless mile, 5K, and 10K races in his lifetime. We got a little break with the weather this year. It was overcast and breezy when my Dad and I arrived at the race at 7am. I was thankful for no sun and was hoping it would even rain. The forecast did call for a 30% chance of rain but it didn't rain. It was 75 degrees and 90% humidity but that is about the best you can hope for in July in Beaufort. We've had much worse in the past. I walked around and talked with some friends before meeting Jamie and before I started my dynamic warm-up. Jamie drove from Greenville with our dogs, Justus and Bud. After my warm-up I headed off for an easy 1.5 miles or so run around 7:40-8:00 min pace. I was nervous. I get more nervous for this race than I do bigger races like marathons. I think that has a lot to do with wanting to win so badly I put a lot of pressure on myself. I kept telling myself to stay clam on the warm-up and later while waiting on the starting line. I lined up on the starting line next to Katherine Price and Heidi Tucker. They were both running the 5K with a goal of sub 19. I believed they would run sub 19 and sweep the top two spots. The race started and I was out fast for the first 400m but then settled into my goal pace with Katherine and Heidi ahead of me. I ran the first mile in 6:05, right on goal pace. Katherine went out fast and ran the first mile in 5:43 and was leading the women's 5K with Heidi not far behind. I kept an eye on the leaders as we neared the 5K turn-around. I wanted to see who would turn and who, if anyone, would continue straight on the 10K course. Everyone but one runner ahead of me turned. When I hit the 5K turn-around I checked my watch and noted the 10K leader was about 40 seconds ahead of me. I didn't panic. I stayed on my planned pace thinking he would slow down and come to me. At mile two, the 10K leader was only 20 seconds or so ahead of me. I ran mile two in 6:08. I was gaining on the leader without picking up my own pace. I felt good as we ran down Lennoxville Road. The leader passed, Paul Kelly who was leading the 10K wheelchair race. I checked my watch again his lead was down to 15 seconds. I kept gaining on the 10K leader as we neared the 3 mile mark. I had caught him and passed him shortly after three miles. I ran mile three in 6:05. He stayed close to me for about a quarter mile on Ann Street before I felt like I was pulling away from him. I felt good enough to pick up the pace but didn't see the need if I was pulling away while staying around 6:05 min/mile pace. The course then makes a right turn onto Live Oak Street and a left onto Broad Street. Shortly after turning onto Broad Street a car blatantly cut me off. I was running straight on Broad while the car was trying to make a left turn off Broad onto Marsh Street. There was no cop or volunteer at the intersection. The car came very close to hitting me. I slapped the side of their small SUV and shouted at them before continuing on. They should have had a cop or volunteer at all intersections at signs out saying "caution road race" to alert traffic that runners were on the road. I composed myself and continued on, running mile four in 6:04. Shortly after mile four, I saw Jamie and my Dad. I asked them how far back, referring to second place, and Jamie estimated 15 seconds. After running to the end of Broad Street the course makes a left turn onto Moore Street and another left back onto Ann Street. I was still feeling good and gaining more confidence as I neared the five mile mark. I ran mile 5 in 6:09. The 10K runners that are still going towards mile four get a chance to see the leaders after mile 5 on Ann Street between the intersections of Live Oak and Hill Street when runners meet going in opposite directions. I first saw Sonny's daughter, Kelley, and she cheered me on. I next saw my friend Eric Rowe and he was very excited to see me leading. He cheered the loudest as he shouted "Go Tyler" as I passed him. This was the latest I had led at Beaufort. I made the right turn onto Hill Street and another right turn, the turn for home, and was back on Front Street with about 0.70 miles to go to the finish line. I felt confident this was finally going to be my year to win. I started thinking of how I could celebrate as I hit the finish line. I started smiling bigger and bigger as I passed the Old Post Office, about 400m to go. I started raising my arms, pointing to Heaven and shouting "For you Sonny" and "Finally" repeatedly as I finished. I finally won! My time was 38:15, not my fastest 10K and not my fastest 10K at Beaufort but it was fast enough to win by 37 seconds. One of my training partners, Ryan Bingham, finished 3rd overall in 38:57 in his first time ever running the 10K at Beaufort. I kept shouting "For Sonny" and "Finally" as walked through the finish chute. I greeted Jamie with a sweaty hug after I had calmed down some. Kelley won her age group in the 10K. Kelley wrote "Sonny" on one arm and "Taylor" on the other to honor her parents. The Carteret County News-Times interviewed me and Kelley after the race and printed our picture. Katherine and Heidi had a close race in the 5K. Katherine led the first 1.55 miles and more until Heidi caught and passed her. Katherine didn't give up and ran Heidi back down. They finished with the same time of 18:59 but Heidi was given 1st place female 5K. They both got their sub 19 goal and finished 1-2. My friend Duane Novotni ran the mile and 10K double. He placed third overall in the mile in 5:55 and fifth overall in the 10K in 40:43. His wife, Michelle, ran the mile and 5K double; placing 2nd overall female in the mile and 2nd in her age group in the 5K. Paul Kelly won the 10K wheelchair in 49:16. A total of 662 participated in the Beaufort Road Race this year, down 143 from last year. The Beaufort Rotary Club as a goal of reaching 1,000 participants and I think they can with some improvements. I recommend they start engraving the back of the award medals like they used to do instead of passing out medals that do not have the date, event, age group or overall, listed on the back. They should also consider tech shirts instead of cotton. Another suggestion would be to start earlier. July is hot and humid. I think if they asked the participants if they would be in favor of a 7:00am or 7:30am start for the 5K and 10K the majority would say yes. A final suggestion would be to pass out gift cards to local restaurants and the local running store to overall and award winners. They used to have better awards than just a medal and I don't know why they changed it. Doing those things would make the race better and more likely to get more participants and more competitive runners. I'm still very excited and happy I won Beaufort. This win was a long time coming. I asked people in the Crystal Coast Running Club facebook group to wear their neon green at this race and was glad to see that so many did. Sonny was known for wearing neon green when he ran. I plan on doing it again for the Twin Bridges 8K Road Race October 4, 2014. Sonny will never be forgotten and I plan to carry on his legacy and honor him as best as I can. Sonny will always be with me when I run. 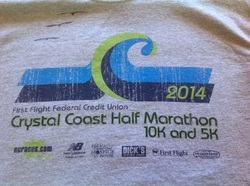 This was the seventh year of the Crystal Coast Half Marathon and there were some changes and additions to this years race on March 1, 2014. The start/finish line was moved to Evans and 6th Street in front of Ruddy Duck Tavern, just a block away from the start/finish in previous years. The race added a 10K to go along with the half marathon and 5K. Runners in the past wanted to run over the Atlantic Beach high rise bridge but didn't want to do a half marathon so the addition of a 10K gave them the opportunity. I've run this race every year and it is my favorite race in my hometown. Unfortunately, this race has bad luck with weather. I think it has rained in all by two years and been windy in all of them. This year we got a break from the rain. It was still cold and windy but the wind was a lot less than what we've had to deal with in the past. 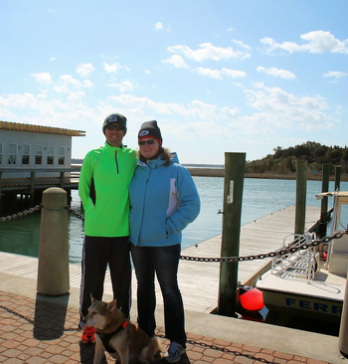 The temperature was in the upper 30s with a wind chill of 31 degrees when my Dad, Jamie, and I arrived at the Morehead City waterfront for the start. The wind was out of the North at 10-15mph. That meant runners going to have to fight a headwind once we turned right off Fort Macon Road and headed back over the Atlantic Beach Bridge to Morehead City. The course is flat minus the bridge. The bridge is at miles 5 and 11. The bridge is 400m up and 1.5 miles over and back. The course makes a three mile loop around the Morehead City Waterfront on Evans and Arendell Streets. Runners then run down Shepard Street and go over the Atlantic Beach high rise bridge and make a left onto Fort Macon Road. Runners then take a left onto Bogue Sound Drive. After doing the loop on Bogue Sound Drive, runners stay on Fort Macon Road until the turnaround. On the way back, runners don't do the Bogue Sound loop and instead stay on Fort Macon Road until a right turn onto the Atlantic Beach Causeway which takes runners back over the bridge to Morehead City. Once back in Morehead City, you take a right back onto Arendell Street and head to the finish line on Evans Street. This was my first half marathon in 2008. Even with less than ideal weather conditions for this race I've still ran some fast times here. My current PR of 1:20:16 was set here in 2010 and I followed that up with a 1:20:17 in 2011. Last year I ran a 1:20:20 and placed 2nd overall. In the previous six years I have placed 2nd, 4th, 2nd, 4th, 1st, and 2nd overall at this race. My goal for this race was to break 1:20. I've been chasing sub 1:20 for awhile and felt like I would have gotten it already if it wasn't for some of the wind at this race in the past. I could have picked different half marathons but I like this race and wanted to break 1:20 in my hometown. The 10K started first at 8:00am. The half was up next at 8:10. I felt good as I lined up on the front line. I looked around and didn't notice anyone that looked fast. The race field size also looked smaller than previous years. I did see Robbie Bass, a Capital RunWalk teammate behind me along with another guy and two women in Capital RunWalk apparel too. My friend Heidi lined up with me and we talked as another friend, Eric Rowe, came up and encouraged me to break 1:20. The race started and I was out front with Heidi right behind me. Since I didn't think there was anyone to push me I focused on pacing off the race director, Butch Robertson, as he was the lead cyclist for the runners. ﻿﻿﻿﻿It was a little windy starting out but the houses were blocking some of it. I was all alone out front but wasn't sure by how much. I didn't hear or see anyone behind me the few times I took a glance back on the turns. I kept my focus on my goal of sub 1:20 as I ran the first mile in 6:02, right on goal pace with some seconds to spare. I felt a strong side wind on mile two as I ran down Arendell Street. Mile two was ran in 6:06. I made my way back to the starting area where the 5K was about to start. I thought they would have started by the time I got back but it hadn't. Butch yelled for them to start it and then he yelled at me to follow him. The 5K started just as I was coming through around 2.5 miles. I had to navigate my way through the 5K runners. Butch did a great job on his bike of creating a clear path through the 5K runners. Some runners did a great job moving to the far right so I didn't really lose any time dodging them. I kept running hard, following Butch and the lead police SUV ahead of him. I was feeling great and still all alone up front as I ran mile three in 5:45. It was a little too fast but it felt good and I knew I was going to lose some time going back over the AB bridge at 11 miles. I was in a good rhythm running down the waterfront on Sheppard Street as I ran mile four in 6:09. The course then turns and goes up the AB high rise bridge. I know I've said it in a lot of blog posts and will say it again but I love running the Atlantic Beach high rise bridge. I had a tailwind going up the bridge as I met some 10K runners on the way back from their turn-around. They all gave me the inside path. I wouldn't be myself if I didn't speed up running uphill and I did just that running mile five in 5:46. I had to remind myself to stay in control and now blow up as I came down and off the bridge. I got my first taste of the headwind when after turning left onto Bogue Sound Drive after the intersection at the Circle at Atlantic Beach. I wasn't on Bogue Sound Drive long but the wind was tough. I was still leading with no signs of anyone close anyone was behind me. I stayed focused and kept clicking off the miles as I ran down Fort Macon Road towards Fort Macon State Park. The wind was at my side and I was still feeling good. I was just simply in the zone and not having anyone beside me pushing me or ahead of me for me to chase wasn't bothering me. I ran miles seven and eight in 5:57 and 6:02. I rounded the turn around shortly after eight miles and saw my competition. Second place wasn't as far back I as I thought he was. He must have picked up the pace a lot since the race started. This gave me a challenge because I still wanted to win the race especially after leading for as long as I had. I knew my pace was staying consistent but I didn't see the mile nine marker. My Garmin was accurate so far during the race because I turned the auto lap off and was hitting the lap button at the official mile markers, like I do in all my races. My current average pace was showing I was running 5:55 so I should have seen the mile marker around 6:00. I didn't see it until 0.16 over where it should have been. Several runners after the race mentioned they thought mile 9 was really long as well. The next mile marker, mile ten was in the right spot. Mile ten was the last mile before the course turned and headed down the Atlantic Beach causeway and back over the bridge directly into the headwind. I ran mile ten in 5:57. I split ten miles in under 1:01, which was faster than the only ten miles race I've ever ran. I felt the headwind as soon as I turned right onto the Atlantic Beach causeway. It was strong but wasn't as bad as previous years. It was a challenge and I knew I had to do the best I could in it because I was sure second place was gaining and possibly going to draft me going into the wind over the bridge. Mile eleven is tough enough going uphill on the bridge but the headwind made it tougher. It felt like I was running harder than the pace on my Garmin was telling me. I ran mile eleven in 6:20, not bad considering the wind. ﻿﻿I was still leading when I came off the bridge and made the right turn back onto Arendell Street. The pace on my Garmin was reflecting not being in the headwind anymore as I was back to under 6:00 min/mile pace. I ran mile 12 in 6:08, still leading but second place was closer. He gained a lot on me since we came off the bridge. Finishing with a new half PR! I picked the pace up when I heard him on my heels. I tried doing a surge to drop him but he was holding on right behind me. Second place made a move on me around 12.7 miles. He pulled out from behind and passed me. He was booking it an pulling away from me. I was currently on pace for my fastest mile of the race. It was a strong move he put on me. I chased him as we turned back onto the waterfront with the finish line in our sights. I knew I wasn't going to catch him as he was about 20 seconds ahead of me when I checked when we turned. I ran the mile 1.12 miles in 6:20, which is 5:41 min/mile pace. I finished second overall in 1:19:33 out of 189 finishers! I was thrilled I finally got the sub 1:20. This was Heidi's third time winning the Crystal Coast Half Marathon. Robbie Bass finished 16th overall and 2nd in his age group in 1:38:02. Despite the wind, Eric Rowe finished with a new PR! I met the winner, Eric Rasmussen, after the race. Eric's winning time was 1:19:21, 15 seconds ahead of me. He's from Wilmington and has a 2:36 marathon PR. He owns a very cool company that takes people on active adventure trips all over the world including the Inca Trail Marathon, one of the hardest races in the world. Even though I placed 2nd overall and didn't win I got the time I wanted. I won the race in 2012 so the time goal was more important to me than winning. I told Jamie and some friends if I got second or third but got the sub 1:20 I would be happy and I was. The course may have been a little long this year but it was still a great race for me. The weather was great in my opinion. Yes, it was cold and windy but it's only the third time it hasn't been raining for this race. Like I said earlier, I prefer the cold and the temperature didn't bother me at all. The wind did slow everyone down but there were still a lot of great performances. The total finishers was smaller than previous years and I hated to see that. I love this race and think NC Races does a great job organizing it. For placing second place overall I received a $75 gift card to New Balance Raleigh - Durham that I will probably use on the NB 890 version 4 running shoe. It's a great shoe for intervals, tempos, goal marathon pace long runs, and even racing. This was my ninth half marathon and all but two have been at this race. The two that weren't were the Run For The Booty Half in Greenville, NC which no longer exists, and the New Bern Bridge Run Half. I may be biased because it's my hometown but the Crystal Coast Half Marathon is better than those two and I think it's one of the best halfs around for the money. Now onto something spiritual that ties in with this race. Jamie and I adopted a Beagle, named Bear, in February of last year. Bear had several medical issues but we gave him a great life with us but he passed away last November. He's been in our thoughts a lot since then. I've randomly seen him laying on the deck of our apartment and in some of his other spots but as soon as I acknowledge I saw him he's gone. Maybe I'm crazy or maybe it's his way of letting us know he's still with us and a presence in our life. Anyways, Jamie noticed a charter boat docked on the Morehead City waterfront while I was running this race. 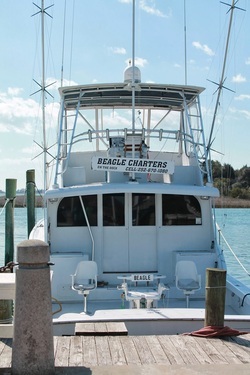 The name on the boat was "Beagle Charters". After the race Jamie showed me the boat. I've ran in this area a lot and never noticed the Beagle Charters boat docked there before. I'm taking it as a sign that Bear was with me as I set my half marathon PR and finally broke 1:20. Jamie wrote her thoughts about the experience in her new blog Never2late2tri. This was the second year of the Cocoa 5K that is part of the Carolina Chocolate Festival in Morehead City on the first weekend in February. I won the inaugural race last year on a cold morning when the temperature was under 30 degrees. This year, the area was hit by a winter storm three days before the race, that brought 1-2 inches of sleet/freezing rain with another 3 inches of snow on top of that. Luckily, the temperature warmed up and melted the snow and ice that was on the race course. I decided to do this years race as a speed workout during my training for the Boston Marathon. It was my second race of the year and my second consecutive month racing on the 1st day of the month. My friend Katherine was also going to do the race and I looked forward to running with her. The last 5K her and I did together was on her wedding day where I paced her to the overall female win at the Run 2 Give 5K in Beaufort in August of 2012. I arrived at the CMAST building where the start/finish of the race was with my Dad at 7am. I walked over to the Civic Center to register and get my packet. The race tee shirts were nicer than last year thanks to the addition of some red colored letters. I talked with some friends that were also running before making my way back to the car. It was cold but not as cold as last year and thankfully it wasn't windy. The temperature was right around freezing and there was a slight breeze. After eating a Powerbar and drinking some water, I did my usual dynamic warm-up routine before heading out on an easy 1.5 miles warm-up run on the course with Katherine. The course is an out and back. You start on a road at the CMAST building, go through the parking lot of the Civic Center, up to the sidewalk on Arendell Street, take the first right past the Visitors Center, then a left onto Evans Street and run all the way to where the road dead ends at the Atlantic Beach high rise bridge. It's flat with a little downhill start and a slight uphill finish. There is a speed bump within five feet of the startling line so you have to be careful starting and finishing over that. The turnout was about the same as last year, around 100 runners. Ryan Albertson, winner of the Historic Beaufort Road Race 5K in July 2013, was there along with two high school runners he coaches. I knew Ryan would win the race but I hoped chasing him would get me a fast time. The race started and Ryan led the way with me and the high school boy side by side behind him. There were some issues getting through the parking lot of the Civic Center because there was no lead vechicle leading us and cars were coming in and they clearly didn't know a race was going on. We took the right turn and we were on the sidewalk headed towards the Visitors Center. Ryan was just ahead of me but I could tell he wasn't running hard, well not hard for him anyways. After passing the Visitors Center and taking a right and then a left to get on Evans Street, Ryan started to distance himself from me and the rest of the field. I felt good but watching him sail away was hard. I started looking for the 1 mile maker and remembered about where it was from last year but there was no mile marker this year. No big deal since I had ran a bigger 5K in Raleigh in December that also didn't have mile markers. I looked down at my Garmin 210 and I was running 5:44 min/mile pace. The race course passes the home of Carteret County running legend, friend, and my mentor Sonny Hyman. Ryan's high school runner was still with me, on my right shoulder and I told him that Ryan makes it look easy and that he probably wasn't going to be running 20 miles the day after the race like I was. I rounded the turn around and hit the lap button on my watch. I ran the first 1.55 miles in 8:54, 5:44 min/mile pace. I did a little surge after passing the turn around. On the way back I noticed Katherine was running strong and currently leading the women's race with Ryan's female high school runner not far behind. Katherine looked focused and deteremined. Ryan was long gone out in front and I was starting to pull away from the high school runner he brought with him. I kept trying to pick the pace up but lacked an extra gear it seemed. I was running hard but felt comfortable though. I felt like my second half split was going to be consistent with my first. Although I had done a surge shortly after the turn I felt like I was running the same pace. I lost sight of Ryan once we got back onto the sidewalk and later in the Civic Center parking lot. I kept pushing hard realizing I had a shot at a PR. Ryan won the race in 16:54 and I finished 2nd overall in 17:44; a new PR for me by 2 seconds. My second half split was 8:50; a four second negative split. The high school runner Ryan coaches finished 3rd in 18:15. Katherine held on and won the women's race in 19:30, beating the time she was shooting for by an impressive 1:20. Katherine was three seconds ahead of the 16 year old high school girl Ryan coaches. I was happier and more proud of Katherine than I was for myself. Finishing with a new 5K PR! After the race Ryan and I talked before he and the two high school runners headed off for 10 more mintutes of tempo running followed by short uphill repeats on the Atlantic Beach high rise bridge. Katherine and I decided to run the whole course again for an easy cool down run. Once arriving back, Katherine and I stretched and waited for the awards to start. We both won free tickets to the Carolina Chocolate Festival. I was happy with my time, it was a PR afterall during marathon training. I think I could get down into the 17:30s while training for a marathon but it is difficult when the two distances require totally different training. I felt good during the race; possibly too good because 5Ks should hurt more and maybe I'm not pushing myself as hard as I can in a 5K. It was a good tempo workout the day before my first 20 mile long run of this marathon training cycle. I have been doing some short surges and in some of my mid week long runs which has helped develop speed in the shorter distances. I'm better at the marathon and I enjoy marathon training and racing more than 5Ks but I would like to get my 5K into the 17:30s. Hopefully Ryan will be able to help me with that once I get past Boston. Overall the race went well but it could be improved. Traffic is low in the area on Saturday mornings but it would be nice to have a lead vechicle and more signs around the Civic Center to alert cars going to the Civic Center and Community College that a race is going on. The course is easy to follow and there were course signs at all the turns. They had more of a variety of post race food this year. The post race food included bananas, water, and different brands of yogurt. The race packets also included a delicious choclate bar from the festival. The Harris Teeter peach yogurt was delicious. A total of 90 runners finished the race. Mr. and Mrs. Teachey did a great job timing the race. I've known them since high school and it's always good to see them. They used to coach the Swansboro High School Cross Country team and they still help out with the team now. I hope the race continues to grow, attract more runners, and becomes a big part of the Chocolate Festival. I started the new year off with a first year race, the Fitness Connection New Years Day 5K in Greenville, NC. It was my first time running a race on New Years Day. The race benefited the Greenville Community Shelter. Two days before the race I did a 16 miles long run with the final 8 miles at goal marathon pace. My training plan for the 118th Boston Marathon on April 21st called for a tempo run on Friday but I bumped it up to Wednesday to do it at the race. I wasn't fully fresh for a race but still felt confident I would have a good run and probably win the race as well. The race course is painfully flat with some turns that do help to make it feel faster. I say painfully flat because I generally don't like flat courses. I prefer some rolling hills and I'm actually faster on a course with hills. Most of the race course is in the Tucker Estates neighborhood. I knew the course well from working previous races held on the same course. I arrived at the race around 11:45am to help the 5Ks 4 K9s group get registered for the race. I volunteer with the group and it's a lot of fun. The group takes dogs from the Pitt County Animal Shelter to local races and runs them in 1 mile and 5K races. It gives the dogs great exposure to the community. The dogs get to socialize with other dogs, get outside, get exercise, and show the community that shelter dogs make great pets. The program has been very successful and all the dogs that have been taken to races have been adopted, and some are even adopted on the day of the race. After doing a 2 miles warm-up and some striders I made my way over to the starting line on Charles Blvd. The race starts with a long straight stretch down Charles Blvd. until you make a right turn onto Red Banks. The weather was great for racing. It was a little cloudy with temperatures in the low 50s with a slight breeze. Over 100 runners lined up including three kids I coach on the D.H. Conley Cross Country team. I've been encouraging them to run more in the off-season and to do local races to stay in shape. I was glad to see Stephen May, Anders Stoakes, and David Liu at the race. Kip Sloan of East Carolina Road Racing started the race and I went out fast. Ahead of me was Melanie Ng on her bicycle. Melanie was volunteering as lead cyclist for the race. After surging off the starting line I settled into sub 5:50 pace trying to stay consistent. I felt alone shortly after the start so I focused on Melanie for pacing. I was feeling good as I ran the first mile in 5:47. I was even talking to Melanie some. I had a big lead already so I had to stay focused. Melanie kept encouraging me as I ran the tangents of the turns. I took a look back once I turned off Tucker and onto Red Banks and I saw Stephen and Anders in second place. As the race turned onto Baytree Drive I noticed there were other course arrows on the road in white chalk that were not ECRR's markings. They were going the opposite way of the race course. I thought this was odd and Kip informed me later that they were not there when he marked the course with cones and signs just a couple hours before the start. I was still feeling good and trying to run faster with just Melanie and the lead police car ahead of me. I ran mile two in 5:49. Melanie kept encouraging me and I picked up the pace still feeling surprisingly well. I did wish I had someone to run with but at least I had Melanie so I wasn't totally alone. I did speed up and ran mile three in 5:33. I sprinted the last 0.1 miles at 5:09 min/mile pace to finish in 1st place overall in 17:57. Stephen and Anders finished side by side for 2nd and 3rd places overall. David Liu finished second in his age group. All three kids that I coached placed and got awards. Another friend, Susan Garvey, ran her 5K PR while battling shin splints. Susan just completed the Couch-To-5K program done by the City of Greenville Parks and Recreation. Once Stephen and Anders finished we headed back out on the course for a cool-down run. We cheered other runners on as they were close to finishing. I kept going until I found my girlfriend Jamie, leader of 5Ks 4 K9s. Her dog was struggling to keep running and just wanted to stop and lay in the grass. I ran with Jamie and her dog Jack to the finish. The 5Ks 4 K9s group did well, the first runner/dog team finished the 5K in 27:17. This was the most dogs the group has had at a race. Nineteen dogs went to the race, with seventeen running, and two cheering from the sidelines. All the adoptable dogs got out of the shelter and got to participate in the race which was an amazing feat all on its own! For a training run, the race went well. My pace was consistent and my last mile was my fastest. The course is flat and fast so if you like that than it's a PR course. I was faster on hills in Raleigh last month for a 5K than I was for this race. It was a good first year race and the awards were nice trophies and medals. A total of 104 runners finished the race.